By all accounts, All Saints Fulham seems a friendly and picturesque church located on the northern bank of the Thames right by Putney Bridge. They celebrate Eucharist three times a week, the churchyard is prettily laid out, and you can watch the tops of red London buses as they cruise from one side of the river to the other. There will of course always be those who spoil the whole impression by pointing out that this is also the place where national treasure Patrick Troughton gets a lightening rod through the chest as The Priest in 1976 satanic shocker The Omen. One balmy summer morning I found myself under the All Saints church tower staring up at that same lightning rod in the company of the Wellcome Library’s Ross MacFarlane. It was at his prompting, in fact, that I took the brooding shot reproduced at the top of the photographic sequence above. We had actually come in search of Al Fayed’s notorious statue of Michael Jackson which is now located in the grounds of Fulham Football Club rather than the tasteful confines of Harrods, where it was no doubt originally intended to distract visitors at the Princess Diana votary shrine. Pilgrims will always need some sort of entertainment, so it seemed appropriate that Ross and I should retain the memory of a hell-born child sent to earth to do his master’s secret bidding as we made our way along the river, past neatly arranged Victorian parks and down shaded avenues of trees, in search of Michael. Like all sites of pilgrimage, this one comes with a price – you have to pay for an official guided tour of the entire stadium if you want to see the statue. To be honest, £5.00 seems a small price to pay to see this extraordinary memorial – especially if you think the recent work of Jake and Dinos Chapman has been less of a challenge than you’d like. Words cannot fully express the glib funerary horror of this monument to fame, mortality and sentiment. The scale alone provokes a profound sense of nausea: at seven feet tall it is too large to be comfortably life-sized and way too small to be imposing. The raised arm with its gloved fist actually seems to have developed some extra joint hitherto undetected in the human shoulder – Ross assured me that there is nothing in the Wellcome to rival it. And yet there he is: Michael Jackson, round the backend of a football stadium staring out across the Thames while in the throes of some unspecified act of entertainment. 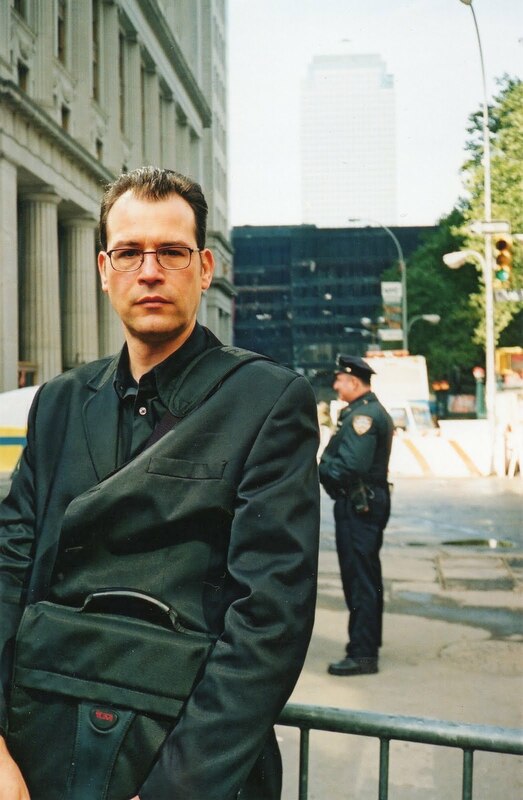 We were married at 3.30 in the afternoon on 13 October 2001, police surveillance helicopters circling overhead. We danced for part of the night and then caught our flight to New York the next morning. The departure lounge was almost empty; and they were only using plastic cutlery in all the bars, cafés and eating areas. There were a lot of empty seats on the plane too. Looking back, I can see that it was the blind faith we had in ourselves and in the plans we’d made during the summer that was now taking us to New York. 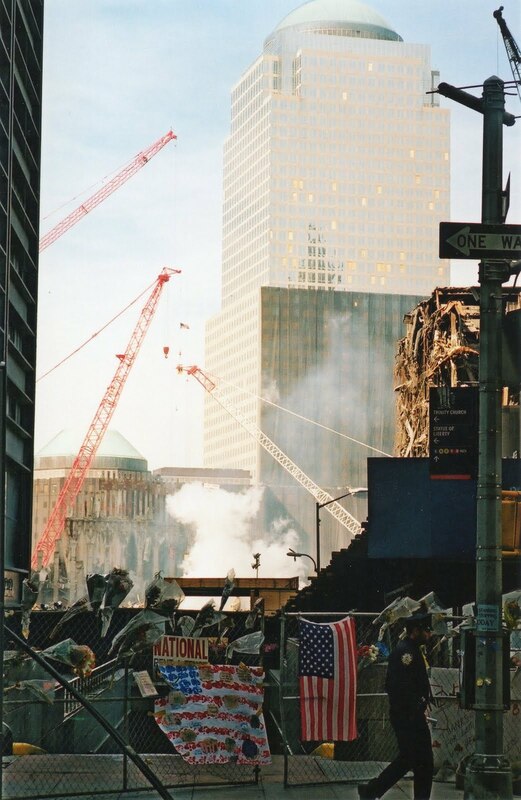 We arrived at the UN Plaza Hotel around ten at night and asked a woman at reception if we could see the swimming pool up on the 39th floor, just so we could find it again early the next morning. All we could see at night as we walked through glass-walled corridors to the pool area were the lights of midtown Manhattan arranged all around us like a universe of stars. An attendant in a white T-shirt and blue overalls was swabbing down the tiles over on the far side of the swimming area, a flattened panorama of darkness and light stretching out behind him. He looked up at us. Trailing a long white cable through the water, a robot pool cleaner shaped like a small mechanical turtle was working its way across the bottom of the pool towards the deep end. The attendant smiled and leaned on his mop. He spread an arm to indicate the starry expanse behind him. The robot pool cleaner continued its journey beneath the silent blue water. Oh my god, my god. He sounded so certain of what he was saying that it was hard not to believe him. He might even have been right just then and that was what they were planning to do. But even so, all we knew was that we were married now and together, and it felt as though we were walking among the stars. The above text is taken from ‘Everything Is Going Extremely Well’, a short story of mine that appeared in issue 6 of Succour Magazine – ‘The Future’. 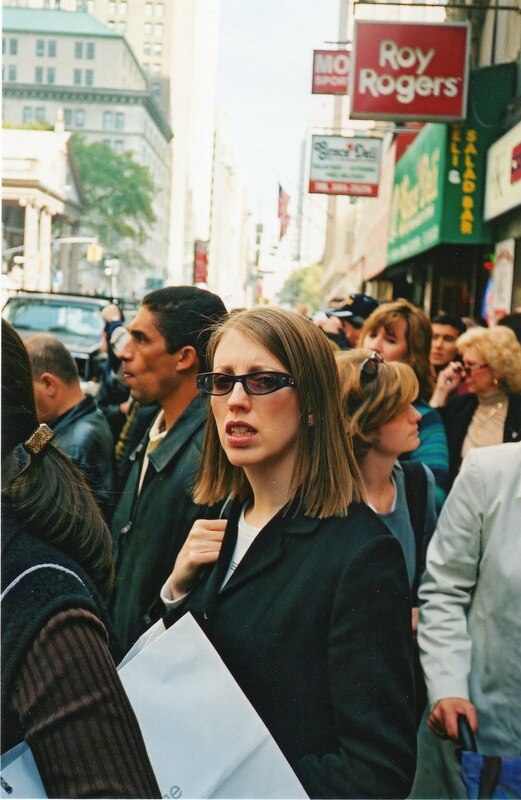 It is a pretty accurate account of what Rachel and I first encountered in Manhattan in October of 2001. 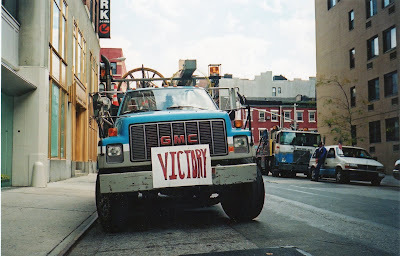 The story actually ended there, so it doesn’t mention the anthrax scare that was taking up all the news headlines at the time or the plane that crashed near Rockaway Beach, or the dump trucks filled with sand and rubble at the end of practically every main street, or the armed state troopers, and the humvees parked up high on the sidewalks, or indeed the fire trucks that would come chasing down the avenues, lights flashing and flags flying – everyone would stop and cheer as one went by. 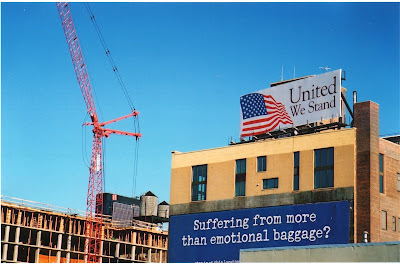 The story also does not include – and not many accounts can do full justice to – what it was like to visit Ground Zero in the weeks following the attack on the Twin Towers. The area was cordoned off, but that didn’t stop a huge press of people from filling the side streets and open areas in the immediate vicinity. The air was dark and smelled of burning – you felt toxic just breathing it in – and everywhere there was this low murmuring of voices as if no one dared to speak too loudly. It felt like we were all crowded together in some vast open-air cathedral. Rachel and I hadn’t gone there with the intention of taking photographs, but in the end there was no other response left open to you but to do so. Confronted by so much sorry and despair and by your own sense of individual helplessness, there was at least some refuge in lifting a camera to your eye and clicking a button. The above are just a few of the pictures we took, and they pretty much capture both the feeling and the moment. The Reverend Sirs at the Hauntological Society blog have just posted the full transcript a text of mine, ‘Karlheinz Stockhausen, the Outer Universe and Me’, which details the story of how Stockhausen and I ended up being photographed together outside a mobile recording studio in the spring of 1999. Originally published in the catalogue for the 2002 Sydney Biennale, it links the two of us with the events of 9/11 through speculations on the future of space travel, a Kurdish street demonstration in Cologne and a missing copy of Robert Anton Wilson’s Cosmic Trigger. In reflecting on my reasons for writing this account the way I did in 2002, I found myself returning once again to the day in October 2001 when Rachel, the love of my life, and I got married: after a lot of thought we had decided to stick with our original plan of honeymooning in New York. Barely a month after the attack on the World Trade Centre, it was a very different city from the one we had visited the previous year and where we had first decided to become husband and wife. 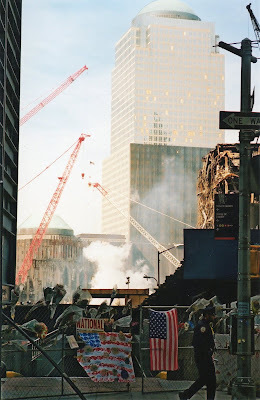 In a forthcoming post on this blog I hope to share with you some of the photographs we took of the crowds and barriers at Ground Zero during our stay. 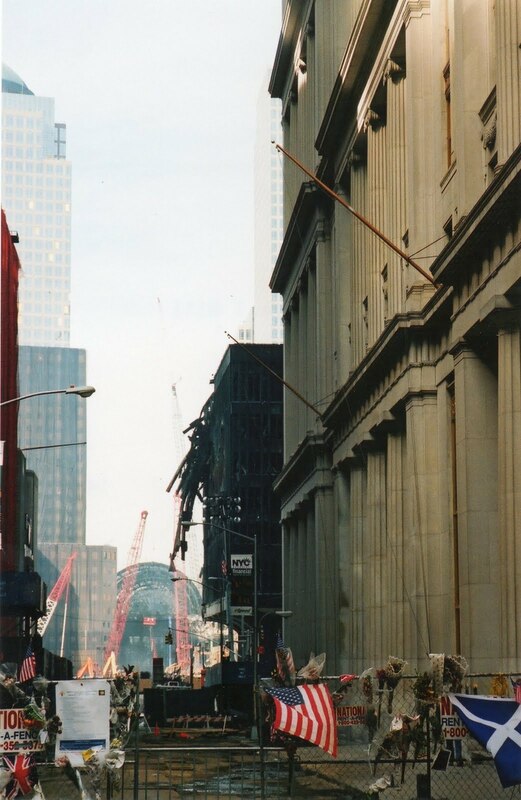 In the meantime here are two views of Manhattan in early October 2001, where the buildings and streets really did seem that empty: taken together, they tell their own story.